Taking for granted an equal moral status as persons, difference feminism asserts that there are differences between men and women that are not or should not be considered equally. "Reverse gender polarity" is a term in the Roman Catholic social tradition, particularly the work of Sr. Prudence Allen on humanism and the Reformation, which labels theories of gender that propose that women are intrinsically superior to men. These theories are understood by Allen to have developed as the opposite of traditional gender polarity, which asserts that men are intrinsically superior to women. The traditional polarity, also known as "patriarchy" or "sexism" in feminist thought, was espoused as early as Aristotle and is claimed to run through the Judeo-Christian tradition as well as the Western scientific tradition. Reverse gender polarity, however, has roots in the medieval era with chivalry, courtly love, and the exaltation of feminine virtue by authors like Heinrich Cornelius Agrippa and Lucrezia Marinelli. 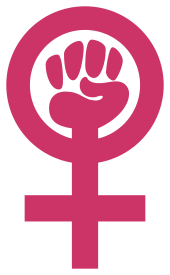 Some have argued that the thought of certain prominent second-wave feminists, like psychologist Carol Gilligan and radical feminist theologian Mary Daly, argue for something like "reverse gender polarity," which in this case would mean that not only do these feminist thinkers believe that women are superior to men, but that "women" and "men" have fixed essences that cannot be changed. However, essentialist interpretations of Daly and Gilligan have been questioned by feminist scholars, who argue that charges of "essentialism" are often used more as terms of abuse than as theoretical critiques based on evidence, and do not accurately reflect Gilligan or Daly's views. ↑ Scott, Joan (1988). "Deconstructing Equality-Versus-Difference: Or, the Uses of Post-structuralist Theory for Feminism". Feminist Studies. 14 (1): 32. doi:10.2307/3177997. ↑ Bock, Gisela; James, Susan (1992). Beyond Equality and Difference. Routledge. ↑ Voet, Rian (1998). Feminism anCitizenship. SAGE Publications Ltd.
↑ Schiebinger, Londa. Has Feminism Changed Science?. p. 8. ↑ Grande Jensen, Pamela. Finding a New Feminism: Rethinking the Woman Question for Liberal Democracy. p. 2 footnote 4. ↑ Tandon, Neeru. Feminism: A Paradigm Shift. p. 68. ↑ Hoagland, Sarah Lucia; Frye, Marilyn. "Feminist Interpretations of Mary Daly". ↑ Sandilands, Catriona (1999). The Good-Natured Feminist Ecofeminism and the Quest for Democracy. pp. chapter 5: "Cyborgs and Queers". ↑ Voet, Rian (1998). Feminism and Citizenship. SAGE Publications Ltd.
↑ Grande Jensen, Pamela. Finding a New Feminism: Rethinking the Woman Question for Liberal Democracy. p. 3. ↑ Allen, Prudence. The Concept of Woman: The Early Humanist Reformation, 1250-1500, Part 1. p. 17. ↑ Allen, Prudence (2002). The Concept of Woman. William B Eerdmans Publishing. pp. 89–126. ISBN 978-0-8028-4735-5. ↑ Rosser, Sue Vilhauer. Women, Science, and Myth: Gender Beliefs from Antiquity to the Present. p. 203. ↑ Money, John; Wolman, Benjamin. Handbook of Human Sexuality. p. 228. ↑ Fox, Vivian C. (2002). Historical Perspectives on Violence Against Women. Journal of International Women's Studies. pp. 15–34. ↑ Rosser, Sue Vilhauer. Women, Science, and Myth: Gender Beliefs from Antiquity to the Present. p. vii-xvi. ↑ Heyes, Cressida J. (1997). "Anti-Essentialism in Practice: Carol Gilligan and Feminist Philosophy". Hypatia. 13 (3): 142–163. doi:10.1111/j.1527-2001.1997.tb00009.x. ↑ Braidotti, Rosi (1992). "Essentialism" in Feminism and Psychoanalysis: A Critical Dictionary. ↑ Suhonen, Marja (2000). "Toward Biophilic Be-ing: Mary Daly's Feminist Metaethics and the Question of Essentalism" in Feminist Interpretations of Mary Daly. Penn State University Press. p. 112.